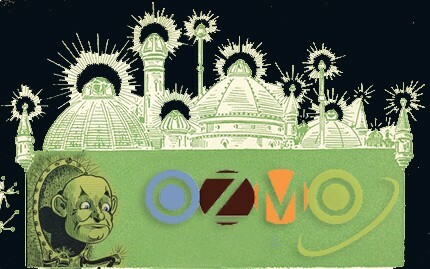 The Wizard of OZMO - As the story goes, the Wizard of Oz was idea to be the end-all-be-all solution to those in need in the land of Oz. Yet, the truth was that the Wizard was nothing more than a charlatan. Take a quick look at one of the Wizards backmiddle the curtain pulling those levers, and pushing those knobs for OZMO - it's Creative Commons. Ozmo is "a new web-based service focused on helping photographers, bloggers, and other content creators license their work for commercial use", according to a blog post on Creative Commons' website. ASMP wrote is their latest Member Update email. "There are no set-up fees with Ozmo and content creators can license as much content as they want. Payment is collected from the buyer when the rights are purchased. Ozmo even helps sellers track and manage sales and buying trends." Fatal Error #1 – On its first day in business, OZMO has likely offended and alienated every professional photographer in the industry. You realize this once you learn that Ozmo is a licensing service offered by the Copyright Clearance Center, an organization that has collected hundreds of millions of dollars in royalties on the reprographic usage (photocopying) of photographs and other creative works contained in publications, and has consistently rejected appeals by photographers and their organizations to distribute those funds to the rightful individualsers. To add insult to injury, the CCC’s Ozmo service has adopted a stock photo licensing scheme developed by Creative Commons, an organization whose leadership has consistently promoted “free culture” which in plain english means the weakening of the copyright protections on which pro photographers depend for their livelihoods. Creative Commons has demonstswiftd a commitment to encouraging open sharing and free usage of photographs and other copyrighted works. The particular flavor of Creative Commons adopted by OZMO is “CC+” a new and untested commercial extension of Creative Commons license packages. Creative Commons has received millions of dollars in support from free culture advocates and has used that support to develop CC and CC+ without participation of the professional photography industry, while every photography organization in the country has been actively engaged in collaborating with picture buyers on the development of PLUS (Picture Licensing Universal System), a comprehensive system of standards designed to simplify and facilitate picture licensing. While ASMP’s announcement refers to the adoption of PLUS by OZMO, the CCC’s marketing materials indicate that OZMO has adopted Creative Commons CC+ licensing. While amateur and hobbiest photographers might find Creative Commons to be a convenient way to berikan their works, few professionals would conmiddler the use of Creative Commons in any form. The reason: Creative Commons is a dysopeswiftal system. Pictures offered under Creative Commons licenses are routinely used beyond the defined scope of use, resulting in widespread infringement.. Attribution is not provided where required. Derivatives are made despite prohibitions on derivatives. The Creative Commons definition of “commercial use” is nothing more than an unfunny joke. Amazon Payments is built on top of Amazon's reliable and scalable payment infraconsttersebuttion. With nearly 70 million active customer accounts worldwide, Amazon.com is a trusted resource for third-party payments online, allowing for instantaneous payments and anti-fraud protection. "At this time, payments can be made only in U.S. Dollars...You can also use a bank account to make payments using Amazon Payments. Only U.S. bank accounts can be used, and a verification process must be completed before the bank account can be used as a payment method." So, unless you're using a credit card (and the nationality requirement of those cards is unclear at this time), you've got to be a US bankholder, payable in US dollars. So, while Ozmo touts "70 million active customer accounts worldwide", it's just US bankholders that apparently can make payments. According to that same ASMP update that arrived via e-mail yesterday, "ASMP members are encouraged to investigate and evaluate this service (OZMO) as one piece of a photographers marketing arsenal." My advice to photography trade organizations: think twice before aligning yourself with an organization (CCC) that is in the business of withholding royalties from photographers, and a service (OZMO) that has partnered with an organization (Creative Commons) dedicated to destroying the livelihood of your photographer members. I think that OZMO might just be DOA. Not sure? Conmiddler Pixish. We wrote critically of them - Pixish, Stupid is, as Stupid Does (2/12/08), and less than a year later, we reported on their demise - Pixish - Finally Dindividuals the Tubes (11/7/08). Sometimes, it takes several quarters to burn through all that "great idea money", before people arrive at the reality of a bad idea materialized and now worth jettisoning. So, perhaps DOA could save everyone some cash and some trouble.